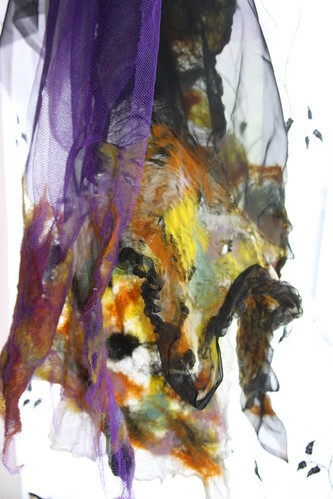 Dyeing and Felting – colour of all sorts are filling my mind at present. As some of you know I have signed up for the Handweavers Guild of America - Certificate of Achievement, along with the Certificate of Achievement in Natural Dyeing being run by the UK Guild of Weavers, Spinners and Dyers. There is method in my apparent madness. One of the things I have discovered since I left work (or it left me..!) is that I have lost my “anchor” and sense of purpose to working/academic life. This I need to recapture and realign so that I can return to work (or increasingly it seems more likely full-time study as that combines with be a carer) as soon as I am “mended” and have a permanent location to be living at. No point in having a job in Bristol, but living in Devon or elsewhere, and vice versa. So I signed up for the Certificate of Achievement (Natural Dyeing) for something to do and to get some structure into my dyeing experiments. But without very much in the way of practical examples of what I am trying to achieve – am finding it difficult to grasp where to start, though I have a few ideas on the subject now. The lady who organises all of this is incredibly kind and I don’t like to bother her, as she has much on her personal plate at the moment, and we have to remember that all this work is undertaken by the kindness of voluntary input. I have spoken with her and we are going to review the practicalities in November after a talk she is giving for the Somerset Guild. The Mentors List though was a disappointment. One of the mentors I contacted, as I knew him from my previous life, didn’t have a clue as to why they had been put on the list… so decided not to embarrass anyone else and source my own – what a hardship !!! The American Version though is very much more didactic, and their Course Book is mind-bogglingly full of instructions for things such as presentation, which simply do not carry across the water, ie we don’t have quite the same stationery options. The American course also covers both Natural and Acid Dyeing, which is of course of great interest to me, so I have set off in hot pursuit of knowledge…. But before I actually do anything I have to address two blinding flaws to address. a total absence of Health & Safety instructions for every ingredient I use – coherently filled all in one place. Now for the latter, all is not lost. I have always had to complete and fulfil H & S paperwork for my courses and indeed I undertook a specialist course to make sure I did know how to do it correctly. Ongoing that is not going to be an issues, but retrospectively for some of my samples – what a blinkin nightmare !! So concentrating on the first – thought I would find an easy way to do this through the LibraryThing application. Well after inserting 33 book details yesterday and another 10 today, and creating a mailmerge to allow import and export of comma delimited files which contain all the info to produce a bibliography….. yawn… yawn…. and on the bright side, I have just discovered that my Alice Starmore collection is worth £85.00 plus each, and my Gill Dalby – is priceless…. Off to lie down in darken room….and dream of where I can locate a “dyeing” Repetiteur of my very own…. Podcast:- Sticks and String – I can’t thank this guy enough for putting some sanity into my world. I listen to his Podcast every Sunday night on the way back from Toby and somehow the topics are always relevant and touch on something I am thinking about or would like to do.